“Cultural appropriation is something that continually happens to African-American artists, and I want to make a stand.” These were the words of British-Liberian artist Lina Iris Viktor, speaking to The NYT about an alleged copyright infringement of her gold-patterned series of paintings Constellations. The artist says her work was stolen by Lamar and unlawfully used in the music video for his recently released single with SZA, “All The Stars,” the lead single from Lamar’s album accompanying the soon-to-debut Marvel superhero film Black Panther. 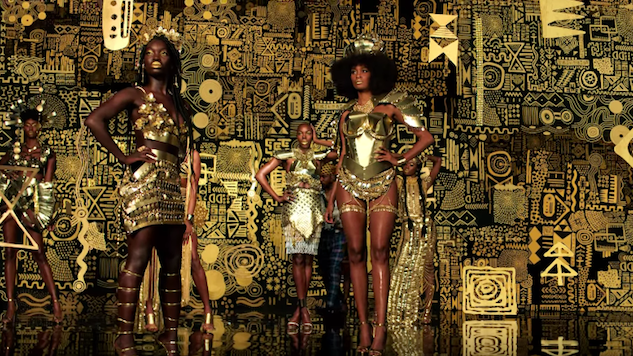 The disputed portion of the “All the Stars” video is a 19-second-long segment (screenshotted at the top of this article) starting at the 2:59 mark, where Lamar walks behind a group of women posed in front of gold-patterned geometric shapes. According to Viktor’s attorney, this segment is not only “immediately identifiable” as the artist’s work, but also violates many of the copyrightable elements in Constellations, including “stylized motifs of mythical animals, gilded geometric forms on a black background, and distinctively textured areas and patterns, arrayed in a grid-like arrangement of forms.” Lamar, Disney, Top Dawg Entertainment’s Anthony Tiffith declined to comment for The NYT’s story, while the music video’s director Dave Meyers and Lamar’s creative partner Dave Free did not respond to comment requests. Meanwhile, Black Panther continues to create excitement, shaping up to be one of the most significant cultural phenomena of the year. Yesterday, Lamar took to Twitter in support of his first full-length album curated specifically for a film, thanking all of those who contributed to making Black Panther: The Album. Revisit the “All The Stars” music video below. Black Panther opens in theatres this Friday, Feb. 16. Stream the film’s soundtrack featuring SZA, The Weeknd, Future and many others, here.